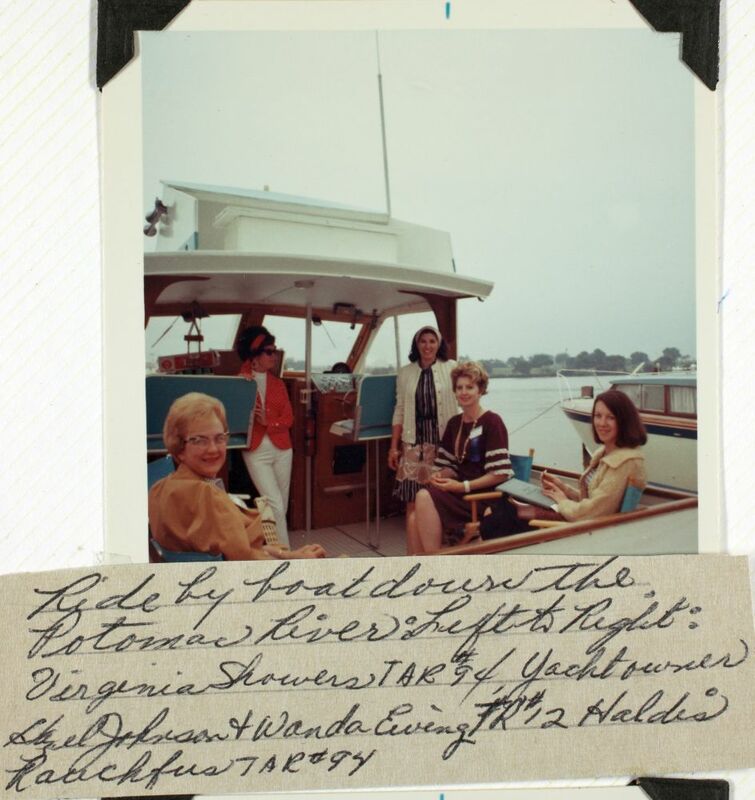 1969 Powder Puff Derby participants Wanda Ewing, Hazel Johnson, Virginia Showers, and Haldis Rauchfus on Potomac River boat tour. 3.5x3.5 color photograph. Image from a scrapbook album belonging to Hazel Smothers, whose aviation highlights include copiloting her plane to 1st place in her class at the 1969 Powder Puff Derby air race, and flying search and rescue missions for the San Luis Obispo County Sheriff's Department in her pink Bell 47 helicopter. For over 50 years the San Diego Air & Space Museum (SDASM) www.sandiegoairandspace.org , has preserved the aviation heritage of San Diego and the world, through a unique collection documenting the history of aviation from the dawn of flight to space exploration. Established in 1961, SDASM is one of the largest aviation museums in the nation, housing the third largest aerospace library and archives. The Museum showcases the history of and contributions to society provided by the development and advancement of air and space technology. The Museum experience provides a means for the public to gain a greater understanding of current and projected aerospace efforts that play such a key role in the national economy, our position in a technical and competitive world, and mankind's future exploration. CollectionThe Museum's Library & Archives houses one of the most significant collections of aerospace-related research materials in the world. Materials in the Library & Archives collections exist in a variety of formats, including books, periodicals, films and videos, manuals, drawings, and more. Many of these collections may be searched on the Museum's online catalog, 207.67.203.79/s92006staff/opac Aerocat , and a portion of the Museum's extensive photograph collection, consisting of over 2 million images, is available on www.flickr.com/photos/sdasmarchives at Flickr.com. In addition, several hundred digitized films and videos can be found on the Museum's www.youtube.com/user/sdasmarchives at YouTube.com channel.Image RequestsTo request images or videos for purchase please visit the SDASM website and then contact us at 619-234-8291 x125, or [email protected]. The Museum charges licensing fees for commercial use of these images, which helps fund ongoing efforts to care for our collection. Information about the works in the Balboa Park Commons is still being researched and made available for public viewing. Much of this data exists in paper records at the Museum. For more information about this work, please email [email protected] and include the Item ID# of the record in the body of your email.